Unable to differentiate between a predator and a tourist boat carrying humans curious to view a colony of seals while resting in their natural habitat, pinnipeds are quick to react defensively as soon as they sense what they perceive as a potential life threat. The closer the vessel approaches, the more likely it is for the animals to rush into the sea in an attempt to escape and the greater the risk of injury and even death in the event of a stampede, or predation once they are in the water. In fact, just the act of remaining alert comes at potentially high energetic costs for the animals. “Although the purpose of ecotourism is to give patrons the opportunity to observe animals in the wild engaging in typical behaviors, ecotourism-based human interactions may insteadalter pinniped behavior by initiating responses indicative of predation avoidance,” explain the scientists. “The periods fur seals spend ashore at colonies are particularly important for resting, evading predators, molting, breeding and rearing young. Fleeing behaviors in themselves expend energy, and time spent in the water as a result of flight responses can also be energetically costly,” they add. To provide recommendations for appropriately informed management guidelines, so that ecotourism does not clashes with the animals’ welfare, the Australian research team of Julia Back and Prof John Arnould of Deakin University, Dr Andrew Hoskins, CSIRO, and Dr Roger Kirkwood, Phillip Island Nature Park, observed the response to approaching boats of a breeding colony of Australian fur seals on Kanowna Island in northern Bass Strait, southeastern Australia. Their study is published in the open-access journal Nature Conservation. Whenever a seal detects a threat while onshore, they first change posture, watch the object and remain alert and vigilant until the danger is gone. In the field survey, such a response was triggered when the research boat approached the colony at a distance of 75 m. Interestingly, this reaction would be more pronounced in the morning (the researchers would normally visit the colony twice a day), while in the afternoon the seals would demonstrate a reduced response. Why this is so, remains unclear. When there was only 25 m between the seals and the boat, the scientists observed many of the animals fleeing to the safety of the water. This kind of reaction is particularly dangerous for the seals and especially their young, as these animals tend to perceive risk based on the responses of the individuals around them. In such a cascading response, a large-scale stampede is likely to occur, where pups could easily get trampled to death or fall from cliffs. “While the infrequency of these events suggests they are unlikely to have population-level effects, such disturbance impacts are in violation of state and federal regulations protecting marine mammals”, note the authors, citing the International Union for Conservation of Nature. 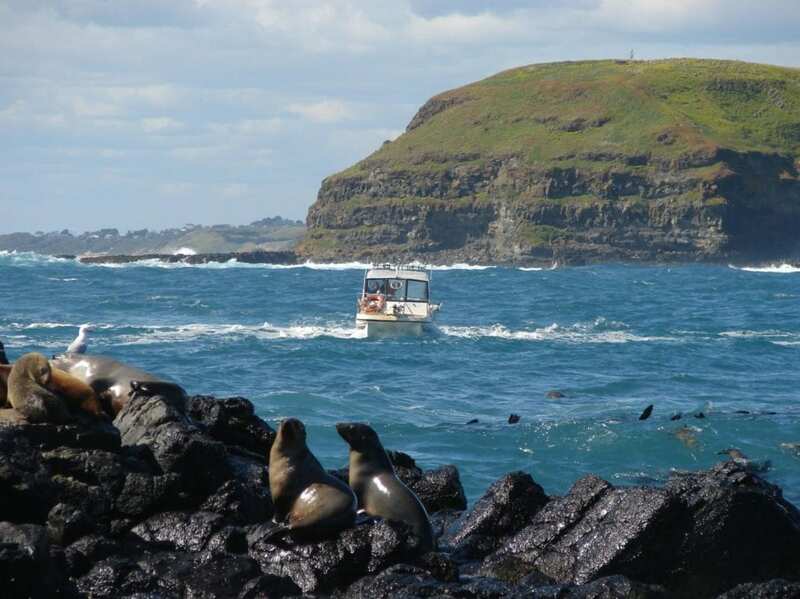 As a result of the study, the management guidelines were updated, so that they currently restrict boat approaches to 100 m at Kanowna Island from March through October, when the rearing of the pups takes place. During the breeding period, vessels need to keep a distance of at least 200 m, as previously. In conclusion, the authors also note that their findings are limited to a single colony and are therefore insufficient to make any generalisations about other species or even other Australian fur seal populations.